Putting new blades in my knives helped a lot too, since that made skiving a lot more effective. This is my fourth English saddle using Anna Kirby’s amazing step by step tutorial. Saddle in progress- about half way done here. 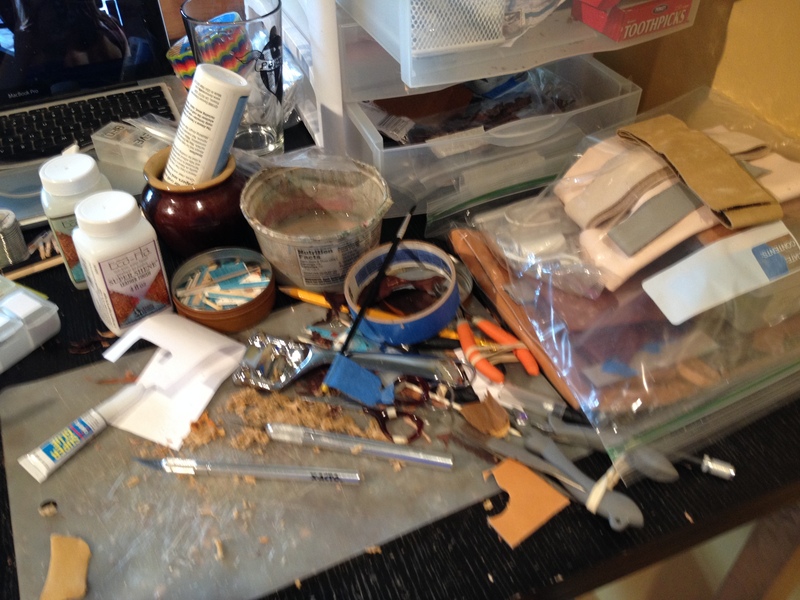 Saddle making makes a big mess. My pants and the floor are littered in little bits of skived leather. As usual, it took three attempts to get the panels right. Now that the saddle is done, I’m working on the matching bridle. Lots of wee buckle-making going on around here. I’m hoping to get all my English stuff in order first, but if all goes well, I’ll also be attempting my first ever Western set soon. Dreamflite Design English Saddle Tutorial! I’m a little late on the news, but if you haven’t heard, Anna Kirby of Dreamflite Design has released her long awaited Stablemate English Saddle Tutorial. And trust me, it would not look anywhere near that good without the tutorial. Her guidance is invaluable. 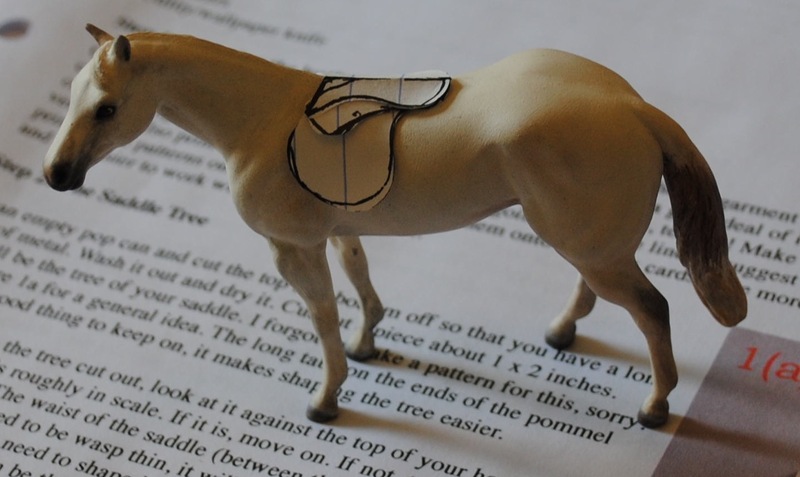 Anna is graciously sharing her tack making secrets for free until January 17th. You can email her and request a copy. After the 17th, the PDF will be available for a totally-worth-it $10. The tutorial is extremely thorough and professional, with tons of helpful pictures. I would encourage anyone with the means to purposely wait and pay for it. 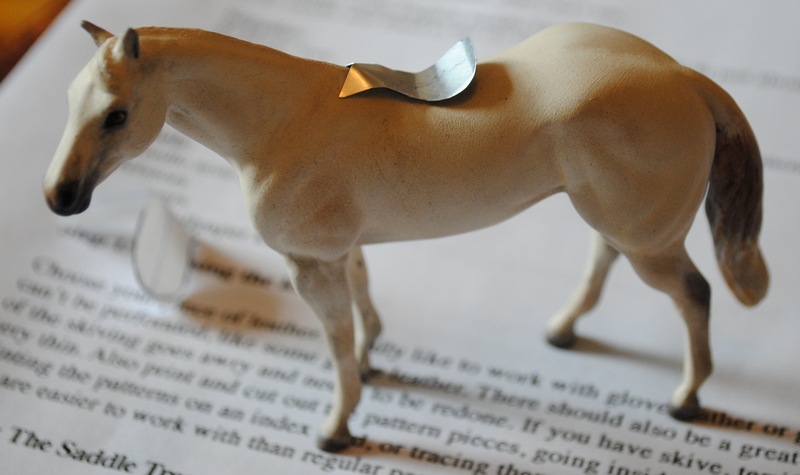 Thank you Anna for sharing your brilliant methods with the model horse community, and for putting so much work into producing a helpful and thorough document. I am honored to have been asked by Anna Kirby of Dreamflite Design to test out her upcoming English Saddle tutorial. It’s a revised version of the one I’ve previously raved about, with lots of super cool techniques and tips. I haven’t had a lot of free time on my hands but I did manage to at least get started on the saddle which means skiving, skiving, and more skiving! Although cutting on glass does make for more precise cuts, it also means potentially breaking said glass during moments of clumsiness. I do NOT recommend cutting your thumb open on the now broken piece of glass. 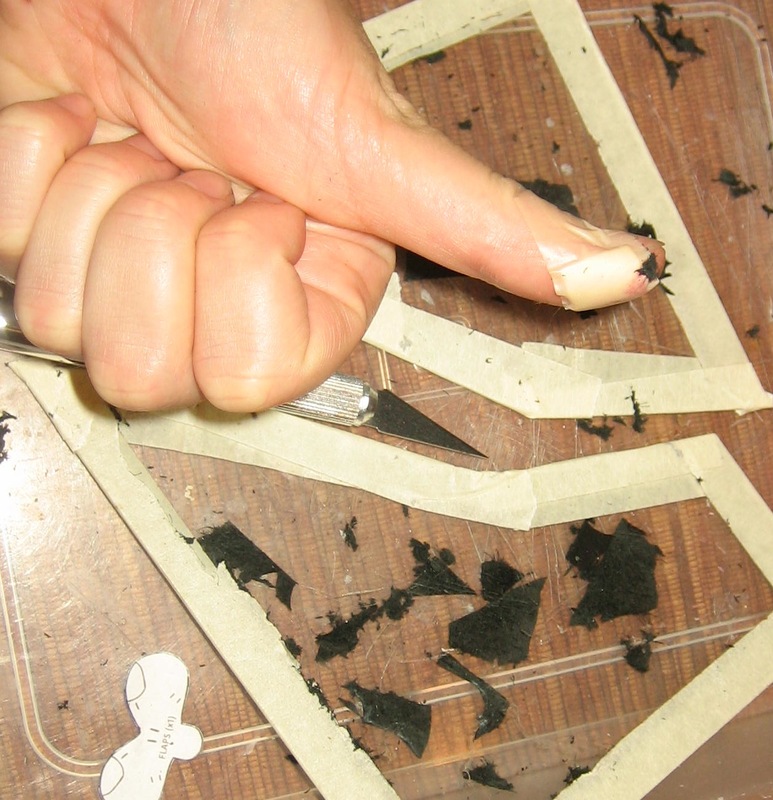 Always cover the edges in masking or duct tape immediately. Or resign yourself to adding Band-aids to your tack making supplies. Back in May before we moved to our new apartment, I was working on a stablemate sized English saddle, using Dreamflite Design’s tutorial as a guide. As I was working I took photos to accompany Anna’s tutorial so that I could make a post that details my experiences with this great guide. Before I had to pack up my studio I had completed the basic saddle (it still needs stirrup leathers, skirt and a girth). 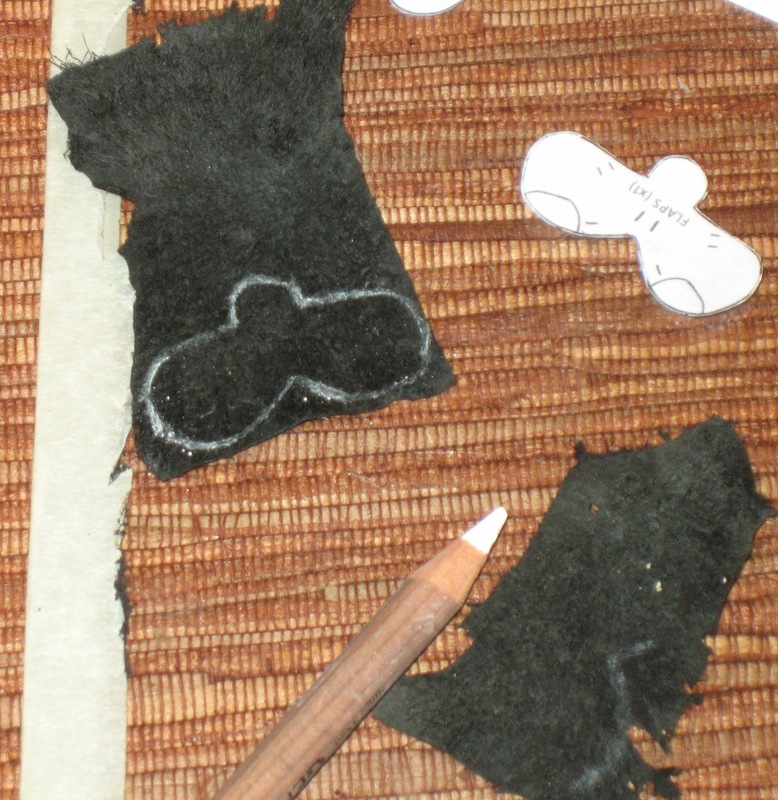 Anna is now working on a new, updated saddle tutorial, which I’m looking forward to very much. 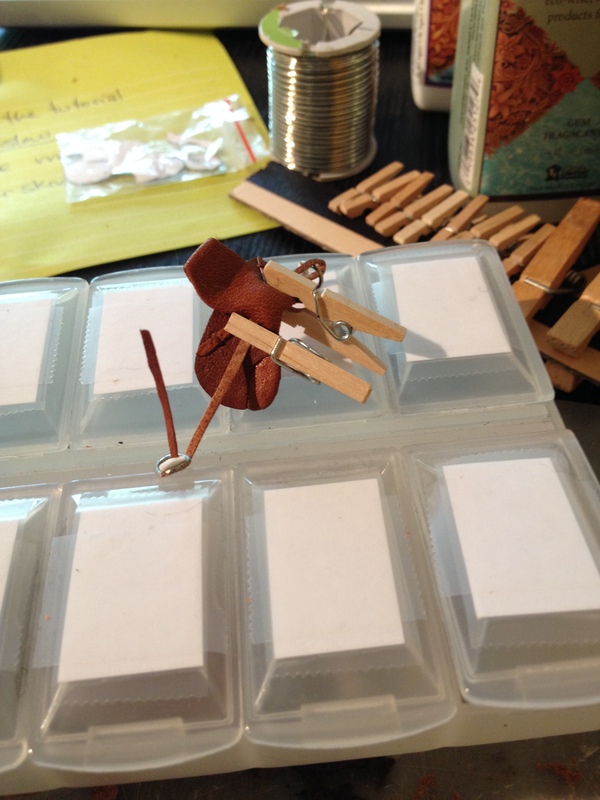 But while we wait patiently, I thought I’d post these pictures and comments for other mini tack makers. This is my second saddle using this tutorial. The first one is in Schleich pony scale and turned out just lovely. Please keep in mind that this post is meant purely as an accompaniment to Anna’s tutorial. 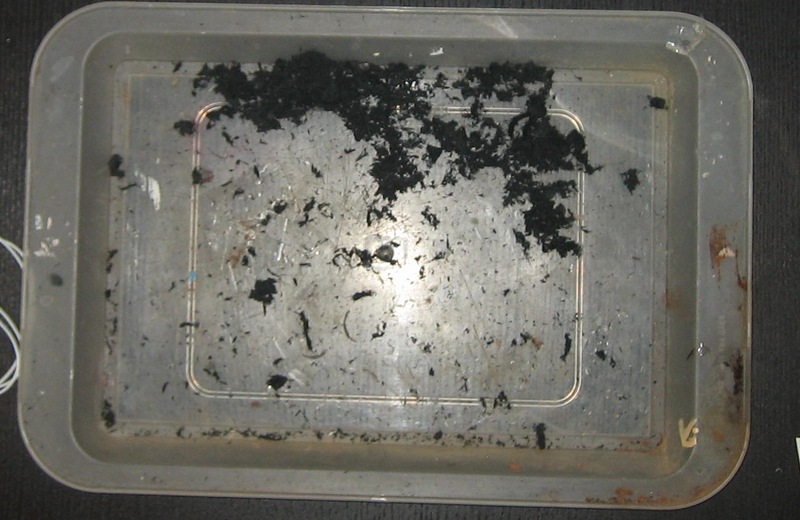 It is only pictures of my process using her work as a guide. Using the tutorial’s attached pattern as an example, I made a pattern out of paper. This took several attempts to get the shape and size correct for my model. Using the pattern I cut my tree shape out of a clean pop can. 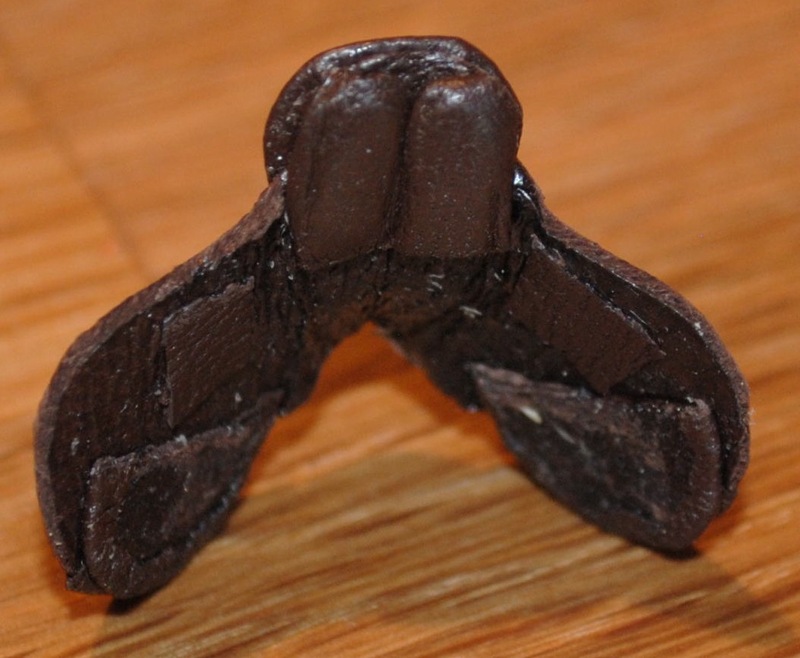 Once again this takes several tries for correct fit, and particularly to attain the correct shape with the bends. My tree is a little different than Anna’s because I left out the stirrup bars. 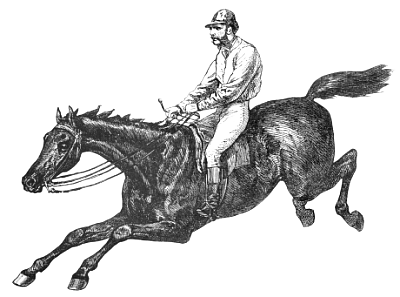 I will attach my stirrup leathers under the saddle’s skirt later. Here I am starting to cover the tree in leather. And voila! Make sure you pull the leather nice and tight around the tree. Once the glue is dry you can bend the seat back into the proper shape. 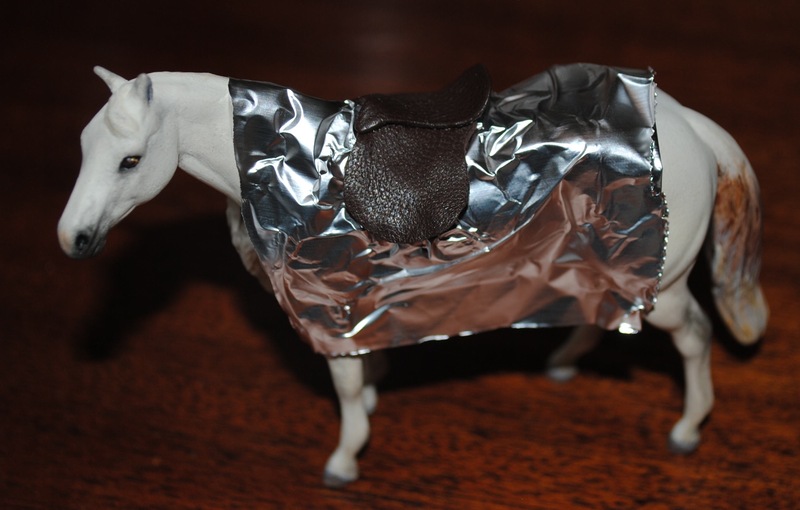 Before attaching the saddle flaps (in step 4) I covered my horse in foil to protect his finish. 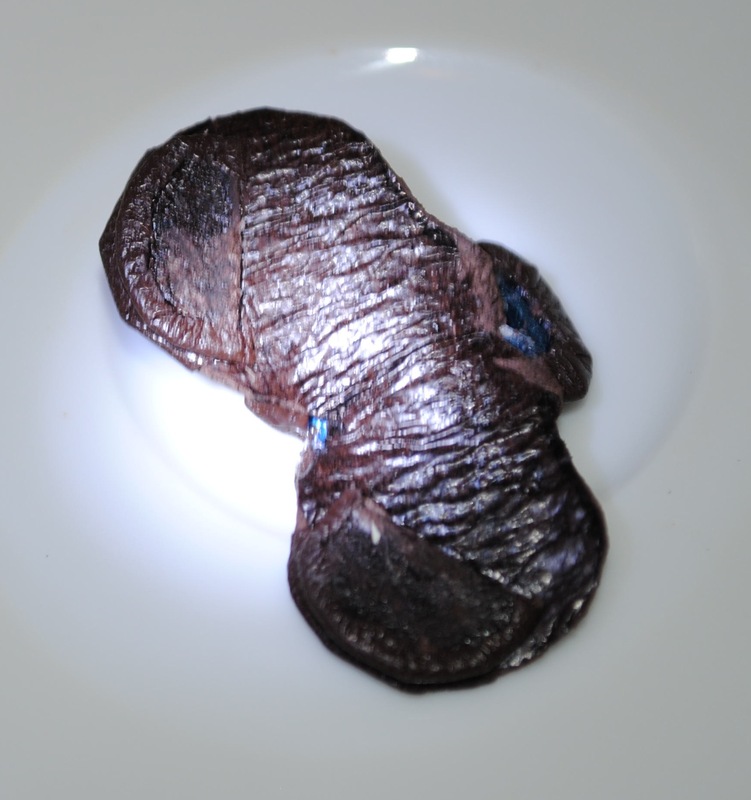 Foil and cellophane both work for this purpose. 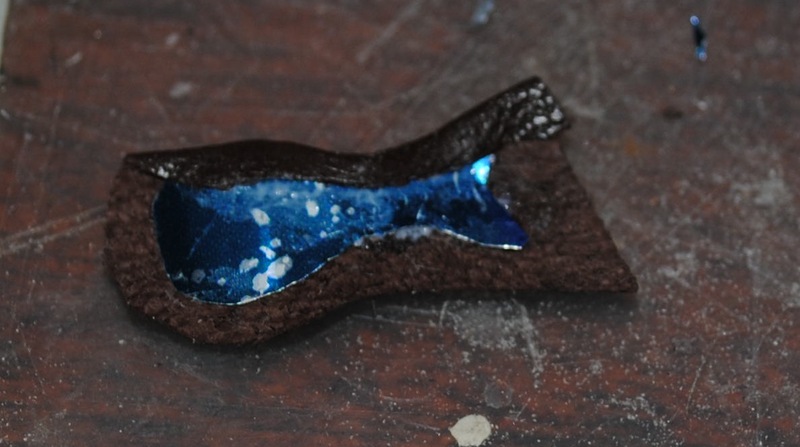 After creating the secondary flaps (pictures 6c-d in the tutorial) I attached them to the bottom of the saddle. 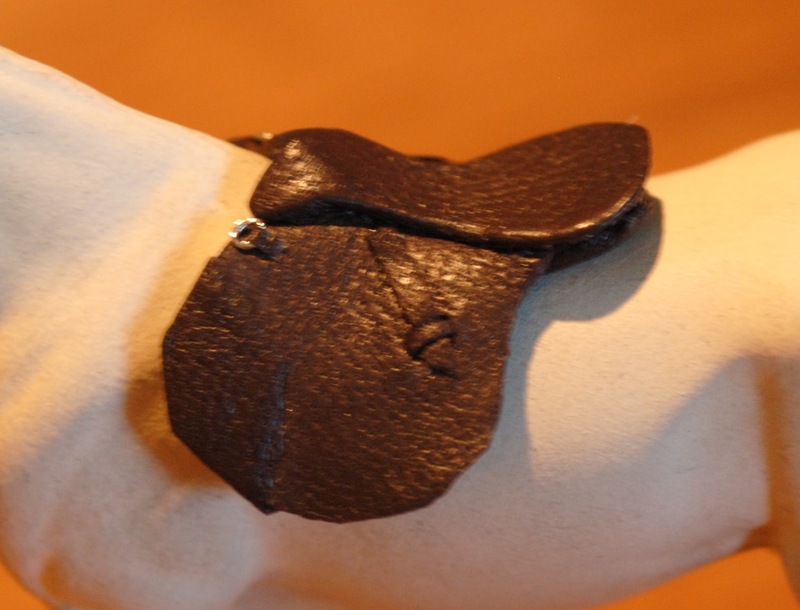 This second pair of flaps on the saddle adds great shape and realism to such a tiny piece, with relatively little work or stress on the tackmaker’s part. The hardest part of an English saddle for me is the panels. Below are my three tries at panels. 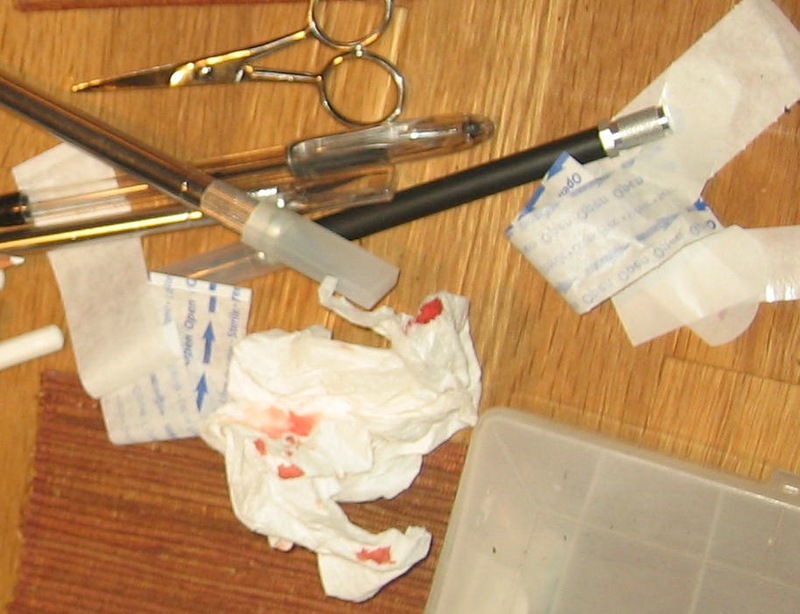 On the left was my first failure, which turned out overly pointy even when that last flap was folded over. In the middle is a pair I tried to create using craft foam as the base, which turned out too bulky. On the right is the pair I ended up using, made with leather on the inside and outside. I have faith that this step will get easier with time and experience. Here’s a view of the underside, with the panels attached. You can also see where I added leather squares to hold and stabilize the stirrup leather keepers on the other side. My first Dreamflite tutorial saddle panels, complete with wrapped around saddle skirt. A bit lumpy, but in scale they look pretty nice. 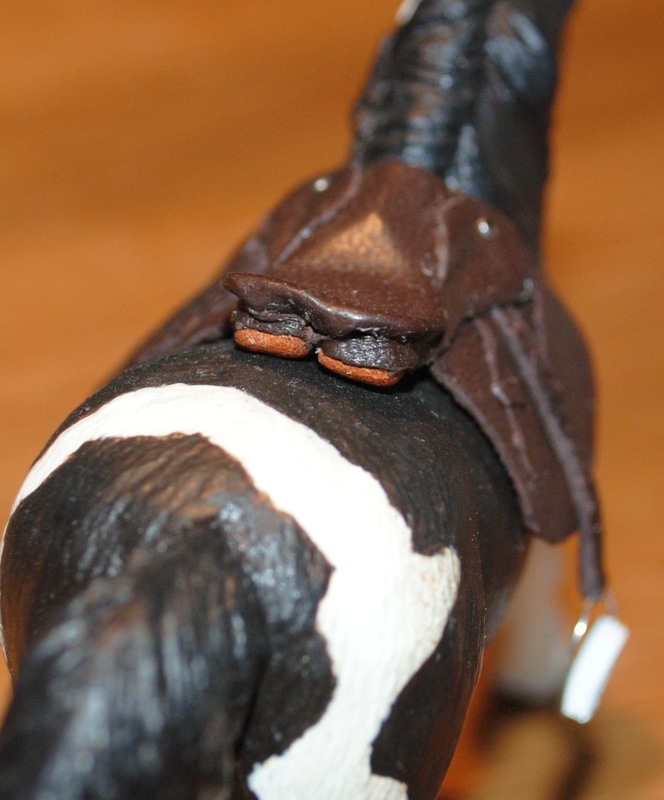 Both saddles together, back view. The Schleich sized on sits a little better because the Stablemate one needs more shape training. The way I “train” a saddle to lie correctly is to leave it sitting on the model with a twist tie holding it to the correct position. Adding the stirrups will help too. Side view of both saddles. Again you can really see the need for some shape training on the smaller version. A grainy close up of the Stablemate saddle in its current nearly-finished state. 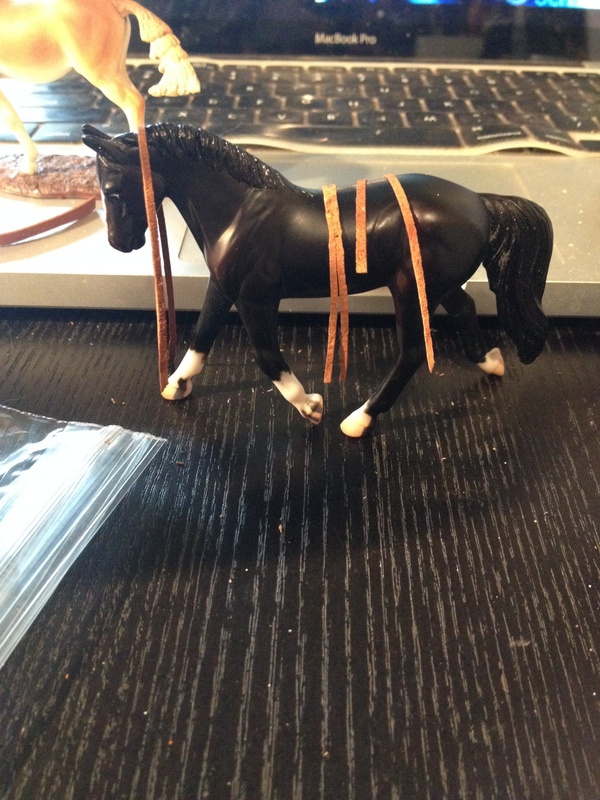 It has half of the stirrup leathers now, including the keepers and D ring, but lacks stirrups, girth, and skirt. The part in shadow along the seat and pommel is where the skirt will sit, and then it will wrap around and neaten up the back view of the panels. I paused at this part partially because I want to make sure the stirrups will fit a rider, and at the moment I don’t have a suitable Stablemate sized rider. Feel free to comment with any questions about my process. It may be a while before I get to the stirrups for this saddle, but when I do I’ll post more pictures and steps. Again, huge thanks to Anna Kirby of Dreamflite Design for her tutorial. 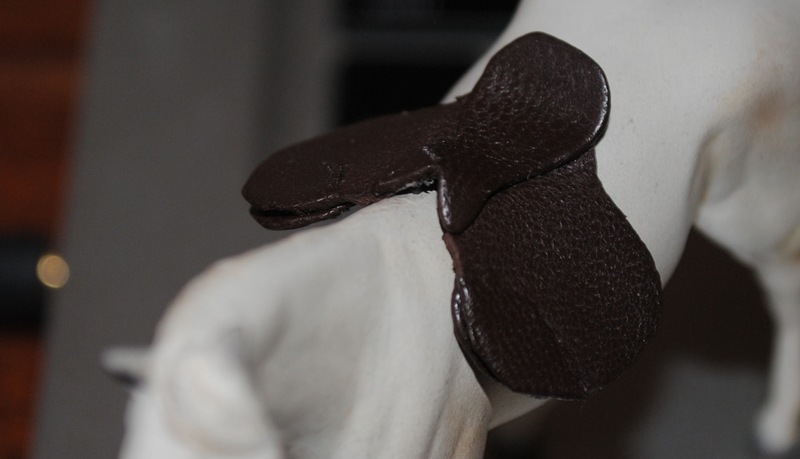 Keep an eye on her awesome blog for tutorial updates and lots of drool-worthy tack. I haven’t been posting much lately and it looks like it’ll be a continuing trend for about the next month. As of yesterday I have a job and a new apartment! Whee! We are moving at the end of the month and I have lots to do before then. And now that I have a job I’m going to have to adjust to a lot less free time. I have been working here and there on a saddle for Jaime and intend to post pictures soon. 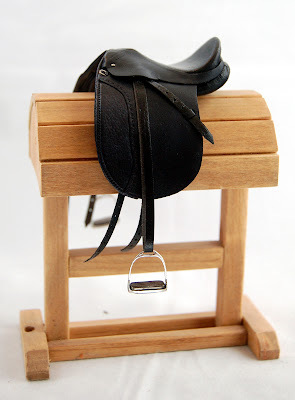 I’m following the totally awesome Stablemate English Saddle Tutorial by Anna Kirby of Dreamflite Design. 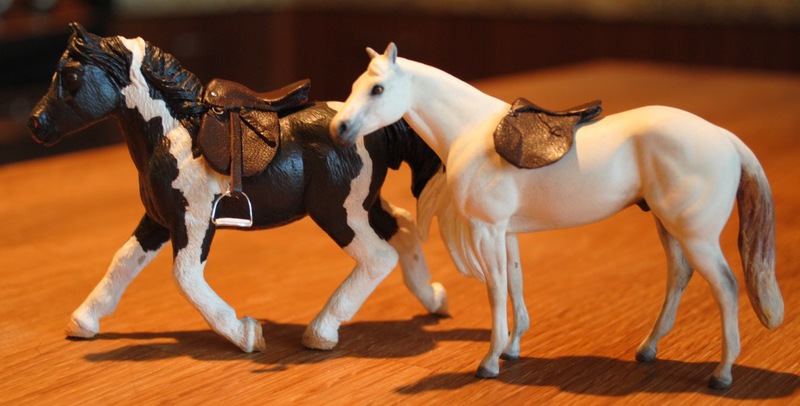 She makes some of the best and most intricately detailed Stablemate tack available. This afternoon I’m heading down to visit my horse and then it’s back home and the beginning of job and moving excitement. I’ll try to keep up somewhat with blogging this month but I suspect I won’t be posting too regularly until mid-June. 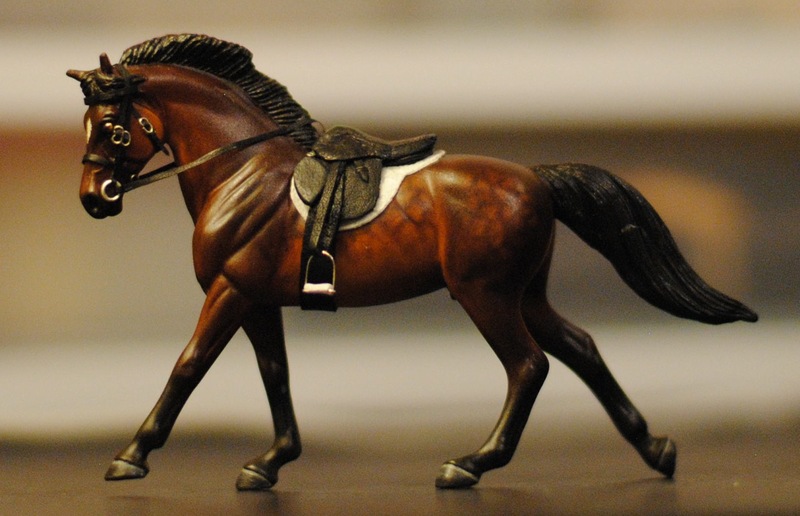 Uber-talented mini tack maker Anna of Dreamflite Design posted a great review of Stablemate scale stirrups from different sources. 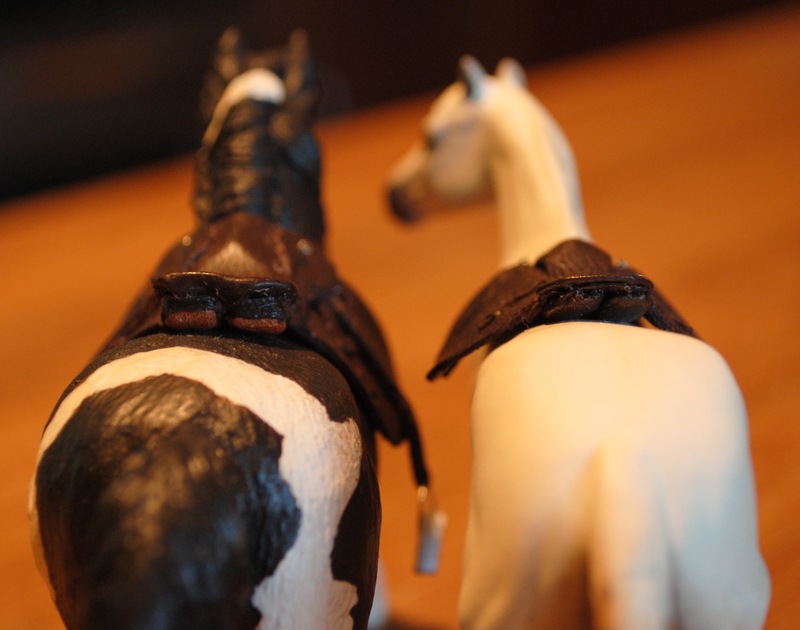 Dreamflite Design: Product Review: 1:32 Scale Stirrups. Isn’t this incredible? 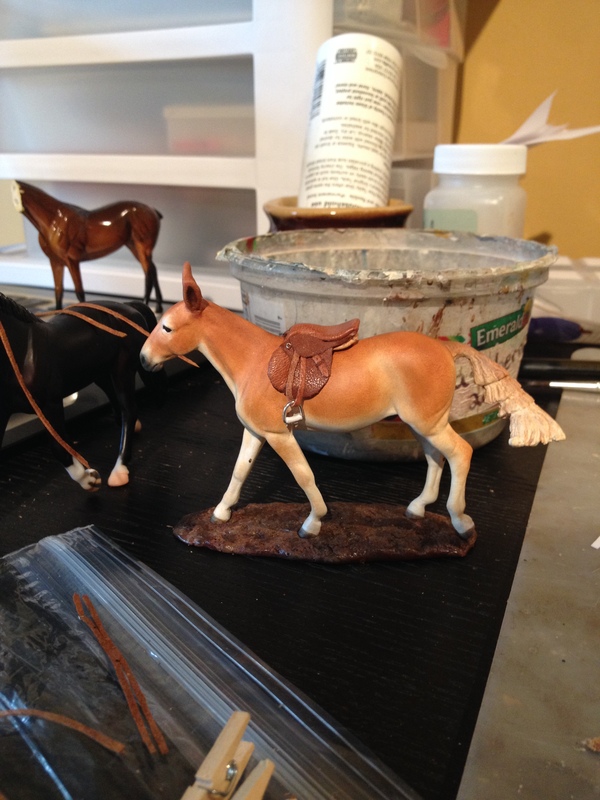 Jennifer Buxton of Braymere Custom Saddlery posted it on her blog yesterday. I love the austere photographs of her saddles on racks because they look completely life like, a photo out of a tack catalog.